Nice heads up. I’m looking at this. In some cases I see the stars, but in other cases I don’t. As to the “user base”. Yes. FB has the user base. Amazingly, when you write an FB review for a local business, it doesn’t go to your timeline. FB, purposefully “hides” the most potentially powerful reviews from the user base that most relevant and largest. Phil, if we were FB friends and neighbors, and I happened to write an FB review about the absolutely Best Pizza in the whole region…..and here is where it gets sticky, Phil…..if you “trusted my judgement”….;). That just might be interesting to you. Hugely motivating. But you won’t see my review……………………..unless I separately put it on my timeline. Our smb’s reference this to happy customers. We don’t PUSH IT. We do get some fb reviews on timelines, b/c of the effort. It would be worth it to emphasize that!!!!!!!!!!!!!! in some of our cases though. Great point, Dave. I agree that FB has a long way to go in making reviews really useful between friends, and in breaking new ground. Right now FB reviews seem like an afterthought. Tons of undeveloped potential. Dave, BTW: in what cases are you not seeing the stars for FB results? I’ve noticed them consistently. Great find Phil. I see 2 of my clients without the stars, and they only have 1 and 3 reviews, respectively, so maybe there’s a min., like the magical Google 5? I’ve seen businesses with 1 review get the stars. For your clients without the stars, I suspect it’s just a delay in Google’s crawls. Yup, you could be right, I see one of them with the stars now. This is an interesting development Phil. I think you hit the nail in the head in terms of Facebook quality-control being an issue. Working with enterprise clients, especially with franchisee models where there is a high-turn over in ownership, duplicate and abandoned Facebook pages with reviews is extremely common. If Google is now displaying Facebook pages with reviews, it will be interesting to see which pages Google decides to display? As for which pages Google decides to display, the main factor seems to be whether the FB content is public or behind a login. General activity (e.g. posts) and links also seem to matter – not necessarily in that order. Classic barnacle SEO. 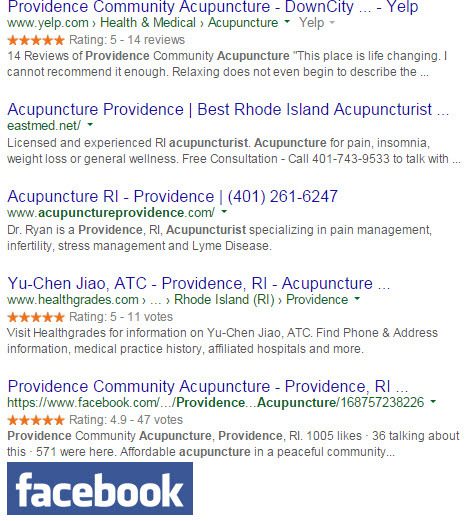 Hmm… I’ve been seeing FB review stars in Google search results for… 1-2 years now? My old restaurant client had them ever since Facebook “went local” a few years ago. I’ve been seeing them in search results for many businesses ever since. Not sure about the exact number of ratings business needs to have but my guess was always around 30-50. Interesting. I’ve been monitoring this closely for a long time, and I never once saw FB review stars until now. Can you send a screenshot? FYI, businesses only need FB review to get the stars. I agree with Max, I have been seeing FB review rich snippets for at least a year now. That may be. I simply hadn’t seen one until the other day, and I watch review sites pretty closely. Again, I’d love to see a screenshot if possible. Hi Phil please send your mail id i will send you the screenshots. Thanks, Linda. My email is phil at localvisibilitysystem dot com. Great post – I’ve been wondering about this for a while now. We’ve been playing with this for about 12 months now, and our “stars” are still not showing up in the search results … I figure a year would enough time for Google to crawl it. How about providing a link to your Facebook page? Interesting, Andrew. Unless you made some big change to your FB page recently, my best guess is that your categories might be a factor. When you picked “Advertising Agency,” was that under the “Local Business” type of page? Yes, some company’s in Edmonton have it like you the example you sent, and others don’t. Just saw your comment, and just checked. Looks like Mark Zuckerberg has bestowed review stars unto thee. You bet – I’m only seeing it on Mac computers, or Safari on a PC … just means Google is doing “the dance” – yay! Thanks for your help Phil! I have noticed this as well. We have a maintenance company (Cajun Maintenance) that our FB page shows stars for in Google search. We also have a restoration company (United Fire & Water Damage) that does NOT show stars. Both pages have 5 star reviews! The Cajun Maint FB page was set up as local company. United Fire was not. I made the change about a week ago…. still not seeing Zucherberg bestow stars upon me!! Hoping that will change soon! In the UK we have seen that some businesses had review stars for a good while but not all. We could find no obvious reason why some were chosen and others not. Big or small. Old or new. Authoritative or not. Active or inactive. We could not really hang our hat on anything consistently. We checked a few profiles and the schema markup was in place if they had reviews whether they were being shown or not. We put it down to some trust element on Google’s part whether they chose to show the rich snippet for a given business. That was my hunch anyway! Certainly seems now though that all businesses in the UK with reviews are getting the rich snippet which is kind of cool. Certainly, reviews seem on everyone’s radar and Google My Business reviews are now showing up in search ads with location extensions, local listings and organic listings where the business has added the review rich snippet. I like Facebook reviews as so many of our clients struggle to get Google reviews as their clients have not got Google accounts and it is just a bit too much hassle. I know Google has just made that a little easier on mobile (see Mike B’s latest post) but you still need an account. It’s a fairly safe bet that most folks have a Facebook account. It’s likely Facebook will do more in the local space as well so getting a good bedrock of reviews on there now will put you ahead of the maddening crowd! Yeah. Facebook is the one site right now where reviews are (1) reasonably high-payoff, (2) easy to write, (3) not intimidating to write, (4) available to businesses in all industries, and (5) don’t get filtered. Good news for businesses with Facebook Pages! 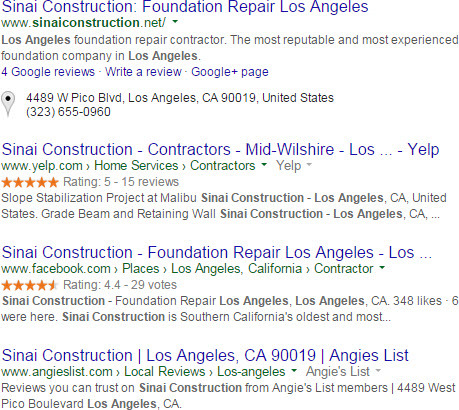 Prior to this, the main sites you would see review stars for would be Google and Yelp. This actually prompted me to make sure that clients could leave reviews, and my own page mysteriously did not have this capability. Make sure to set your Facebook Page category to Local Business with a subcategory of Local Business, and reviews are enabled. 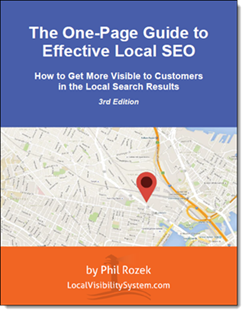 Although the top-level category needs to be “Local Business,” the subcategory doesn’t have to be. I`ve also found it`s much easier to get a review for clients from their customers on Facebook than Google. I have two websites – http://www.cajunmaintenance.com and http://www.unitedfireandwater.com and both of the sites have Facebook pages in place. The rich snippet stars are a mystery to me for both pages… sometime they show up in search results, sometimes they do not. Does anyone have any idea if there is a way to make them appear all of the time?? ?